Each year, Post’s team of writers, contributors and working professionals in the post industry walk the trade show floor to find the latest and most innovative new products, technologies and announcements to share with our readers. That’s why Post Picks awards and Honorable Mentions are so prestigious — because they are voted on, not by the editors of the magazine, but by actual post professionals who intend to use this gear in their day-to-day work. There is no greater endorsement than from the professionals themselves! Imagine Products (www.imagineproducts.com) partnered with StorageDNA (www.storagedna.com) to release myLTOdna for Macintosh, a copy application geared for media files. The software is optimized to take advantage of StorageDNA’s enhanced Linear File Transfer System (Hyper Tape). The system was developed to let users interact directly with files on a tape using their favorite applications for the fastest, simplest LTO tape workflows. By building a Random Access Database (RAD) file for each tape’s media contents, Hyper Tape eliminates the latency seek and restore time inherent with typical linear tape storage. This allows the LTO tape to behave much like a hard drive for high performance video applications such as NLEs and transcoders. With myLTOdna users can streamline workflows: Write directly to tape in the field and use that tape as the source for production editing. 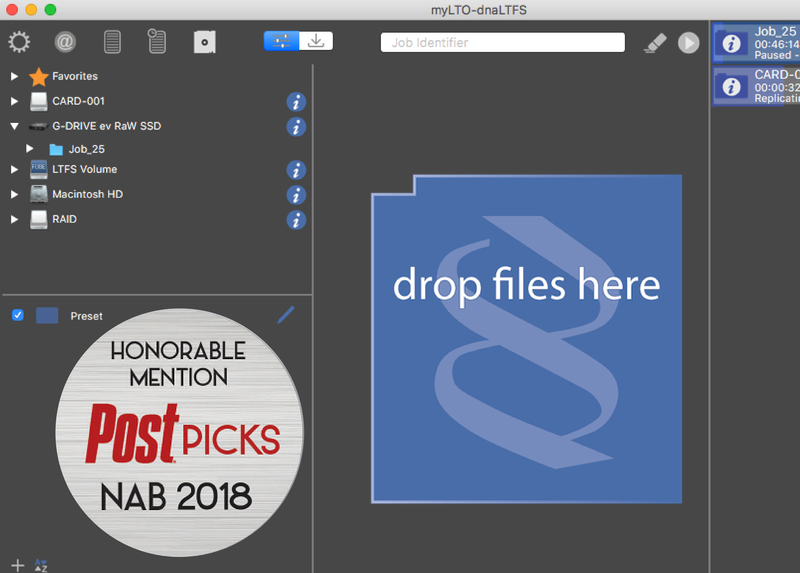 And there’s no need to archive when the project’s complete — it’s already on an LTO tape. myLTOdna will be highlighted on www.postmagazine.com and in their newsletter, as well as in the May 2018 issue of Post magazine.